Cannot Open Your Default Email Folders - How to Fix It? Cannot Open Your Default Email Folders Error: Steps To Fix It! There are certain things which are essential part of our day to day lives. Simply, just take an example of the email client that you use in office daily. What if it starts reverting back with errors or you cannot send or receive messages through it? Definitely, it will be annoying and at the same time is a reason to worry. This segment particularly aims at explaining the reasons for Outlook error "Cannot Open your Default e-mail folders. The information store could not be opened." Also, the solutions to fix the errors are discussed so that access to OST file data can be gained back. This error is generally encountered by Outlook 2007 users and is due to trial to open the OST file in different profile, corrupt OST file, or due to compatibility mode enabled in Outlook. Let us figure out how this problem can be solved. # : Move to the Microsoft/Outlook folder where you can find the .xml (profilename.xml) navigation pane file. Select it and delete it. 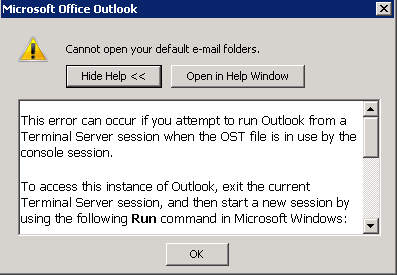 After numerous attempts if Outlook refuses to open the OST file, then it is recommended to delete the profile. Once the existing profile is deleted, it can be rebuild. Again configure the mailbox with new Outlook profile and this might give a solution if the problem is caused due to improper profile. # : Right click on the short cut icon and choose Properties. # : Select Compatibility tab and disable the compatibility mode option (If enabled). If the problem is not associated with the profile (probably all fixes shared above did not work), then to get hold over the database, it is suggested to recover data from OST file to PST. Microsoft, by default has not provided any tool to fix OST file like it provides for the PST file. Therefore, as a work around, the solution is to bank upon an OST recovery tool. The advantage is, the added file will be scanned thoroughly and complete data recovery is ensured with metadata preserved. Error messages are a way to guide user if something is wrong with the application or the database. Taking action on the right time can help to avoid invitation to various problems. Also, if the data stored in file is mission critical, it is recommended to stay equipped with a solution to work around. Do You Know How to Repair Corrupted Offline Exchange OST File? How to Migrate Outlook emails into PDF format?